Or you may make an Appointment with me, I own the store. Don't want to leave town to get your new ski equipment? Ask us how to get a great deal on purchasing your new ski equipment on a special order. We have long-standing relationships with many of the industries largest snow sport equipment vendors. This allows us to provide the hottest equipment at incredible prices. Your kids will probably also outgrow their equipment in a season! Our guarantee is simple: "If those darn kids grow during the ski season just bring back the equipment and we will refit and re-equip for no extra charge!" What a deal. Late Night Pick-Ups and Returns for groups. If you are traveling with a large group of friends or family and are going to be arriving to town late at night we are happy to accommodate your needs. If your group plans on staying out on the mountain late, let us know. We will work with you! Get what you need the evening before and not pay more. Want to get on the mountain faster before those in the line still getting equipment! These hot prices are too cool for school! 2nd and following days are half price !! Westgate is southeast Wyoming’s premier ski and snowboard rental shop! Customer service and family fun are a continuing tradition at Westgate since 1960. 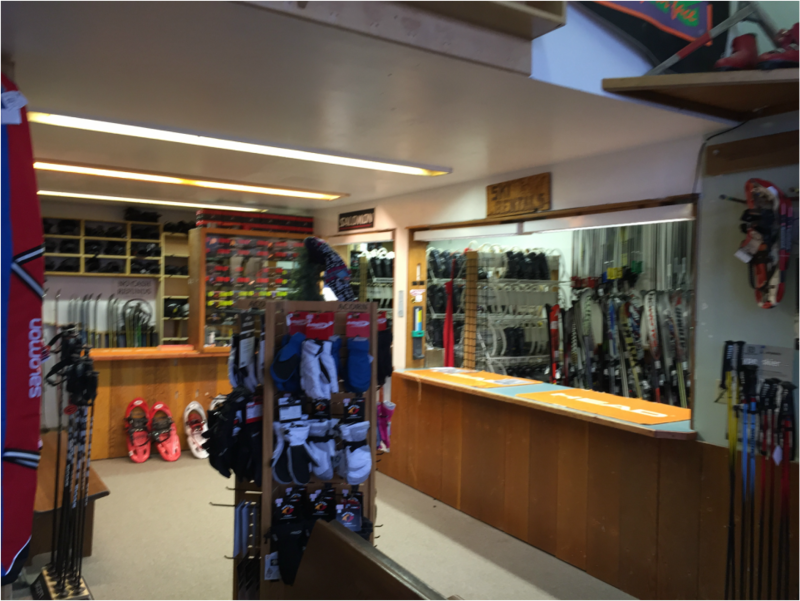 Westgate offers the latest in ski and snowboard equipment, while offering old-fashioned service on a first-name basis. So please come on in and see what we are all about. Stop in and check with us for the latest snow conditions, trail maps, and seasonal specials. Cross County : regular Nordic, & Back Country. We are located on scenic highway 130/230, the Snowy Range Road in West Laramie. In addition to our unique building, we have a sculpture of our favorite skier, Rocky. Our storefront also features a handcrafted signpost, on which hangs one of Steamboat ski area’s original blue gondola cars. For 2018The Whitewoods Outlander ski & binding set is a hybrid of backcountry Nordic glide and snowshoe traction & stability, offering the best of both sports. The significant parabolic side cut of 96mm at the tip and tail and 55mm at the waist easily delivers stability & slow controlled turns in back country powder or in the fields & trails. The wide base keeps the ski tips higher in the snow column. The natural stride with Outlander skis are more like walking compared to the shorter snowshoeing “high step” stride. The aggressive machine cut waxless pattern provides sure footing and grip like a snowshoe on the uphill. The wide base allowed us to engineer shorter lengths of 130cm (for skier weight 90# - 160#) and 145cm (165# +) making it so easy to navigate and explore new trails. Full wrap steel edges & ABS sidewalls come in handy for crusty or icy conditions. The Outlander binding does not require a “ski boot”. Most winter boots already owned will fit in this universal binding. Shoe size, approximately from lady’s 7 – men’s 13, is adjusted by thumb & finger pressure on a spring, adjust the length then release the pressure. Boots are secured by a toe & ankle strap and quick release ratchets. Outlander’s are a great option for back country Hunters, touring, beginners, ice fisherman, seasoned skiers & bored snow shoer’s looking for more speed. ©2015 Westgate Sports , all rights reserved. 1979 Snowy Range Rd, Laramie, 82070.